Make-A-Wish Central and South Texas is challenging you to rappel down 38 stories at the W Austin. Just as the children diagnosed with critical illnesses in the Make-A-Wish program have to overcome fears and obstacles with courage, the first 200 people to raise $1,500 will have to face their fears and jump over the edge! The money raised from the brave patrons of the event will benefit children in Central and South Texas with critical illnesses. For fundraising tips and other general information, contact Kathryn. 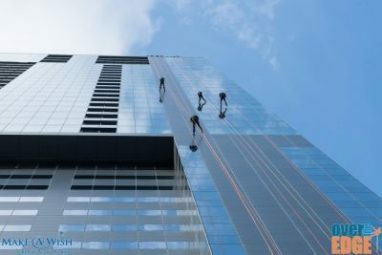 The Over The Edge rappel for a cause will take place at W Austin (3rd and Lavaca) on June 11 and 12. The rappel is from 38 stories up, which is over 500 feet! Last year, Make-A-Wish Central and Southern Texas granted 230 wishes, but over 350 children were diagnosed with critical illnesses. With your help, Make-A-Wish can benefit more of these children and make their wishes come true. As of now, the event has raised enough for 110 wishes, and it is only around $46,000 (eight percent) away from the goal of $600,000. With just two spots remaining on this adrenaline-filled, wish-making experience, now is the time to claim your spot! Helping Doesn’t Have To Be Scary! You might not get the same adrenaline-filled experience, but you will still have a great feeling when you help Make-A-Wish Central and South Texas. One of the easiest, least scary ways to help is to donate an unwanted vehicle to Wheels For Wishes benefiting Make-A-Wish Central and South Texas. When you donate your unwanted car, motorcycle, boat or RV, it helps a local child overcome obstacles with hope, strength and joy by receiving their one true wish. In addition to your car providing a wish for a local child, it will also save you time and money trying to sell your car while receiving a nice tax deduction at the same time! Your donation is 100 percent tax deductible because Wheels For Wishes is an IRS-registered 501(c)(3) nonprofit organization. Donating your car saves you from rappelling down 38 stories, and it helps grant a local wish! To donate a vehicle to Wheels For Wishes, please call us at 1-877-431-9474, or fill out our easy online vehicle donation form. Your vehicle will help bring Make-A-Wish Central and South Texas one step closer to granting wishes for every child battling a critical illness!